Hurrah, it's time to G-O Racing. But will it be another Boring year of The Lewis Show? Yuhs know, Wake up 'N see Hamilton lead from Pole. G-O to Sleep, then Wake up for the Finish and See Golden Child' Win again. Rinse, lather, 'N Repeat; SNORE! Funny, but this year I've been way More excited 'bout the Indy Cars season kicking off due to the Mega influx of new Drivers and a New Universal Aero Kit (UAK18) for which, although I cannot SEE I-T! It definitely sounds far more appealing than this year's Formula 1 Crapwagons! As stick that in your Pipe and Smoke It Monsieur Todt! Whilst after the Wild 'N Wooly St Pete Season Opening weekend's events, i.e. ; Qualie' & Race, Formula 1 will be Hard pressed to peg my interest meter. Not to mention having never given "Thee Young Wicky," aka Robert Wickens a proper chance! As I'll try refraining from commenting upon Halo, which as we All know, has radically affected this year's F1 chassis designs. 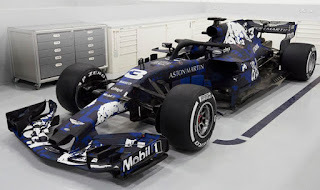 For which Y'all can check out who's Duh Purdiest' 2018 F1 Chassis of All? As colour me Pink; Hya! Which is the Best looking F1 Car of 2018? While I'm not sure who instigated the Rules Clarification, but the FIA has now amended/updated; Err clarified their intentions regarding customer PU (Power Unit) supply Deals offer the same performance levels as the Works Teams - Unless the Customer acknowledges not wishing for similar equipment parity. While this year's grid features only two Bonafied Rookies, with startlingly different pedigrees. As one's a multi Feeder Series Champion, including last year's FIA Formula 2 Championship. While the other, Uhm; Whale' let's just say he's bringing lots of Rubles, shall we? Oh Never Mind! While lastly, although Nobody's addressing the potential "Elephant in the Room," as I'd still dearly like to have somebody explain how a Driver will "Shimmy" down the nose of his car in the case of a KERS/ERS Failure, a la like thee "Incredible Hulkster" *Nico Hulkenberg) suffered last year at Mexico City, ci! But Don't Blink, or you'll Miss IT!